fascinating. I really liked the normal and gentler side of the book in this scene..there is something so regular in life and its pace...BUT..I also understand the movie version, hearing things, tuning in and being diverted. All in all both methods seem to relay the message home. I agree, if you are saying both the book and film do the Oliphaunts scene/capture by Faramir scene well, but in different ways with different dramatic stresses. 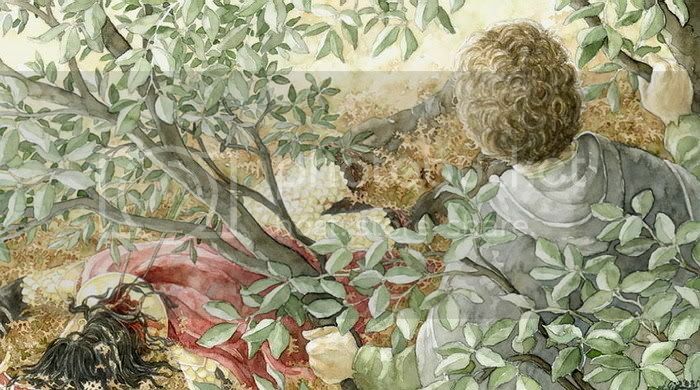 If this weren't a Frodo thread that celebrates the book through images from the films (and their visuals), I'd present the rest of the Ithilien scenes through the LotR illustrations of Anke Eissmann. estelanui gave me a link to page of her work dedicated to the Ithilien scenes. Her illustrations have more of a story-book look than I like, but they are not babyish, mostly because the faces tend not to be either cutsie or pretty. As for the hobbits, there are some of Frodo and Sam that are very good. No, her Frodo does not look like film-Frodo, but he does have dark hair, large eyes, and angular, chiselled features. Her landscape work is quite lovely. Here's her illo from this scene showing Sam looking at the dead Southron (2004). I think it shows off her illustrating skills and style very well. I love this girl's work. I met her, you know, Mechtild, at Oxonmoot in 2001. You met her? What's she like? She's got a HUGE boy of Tolkien illustrations, not just for LotR. I'm very impressed. I don't always love the way she does faces--I don't mean their actual features but the technical skill with which she does them. They often lack specific expression, specific to the situation I mean. But some are excellent. And I always love the way she reneders the natural scene, and her colours are wonderful. She stays within the subdued range I like so well in Alan Lee's work, giving the works a bit of pictoral distance, as if they really are pictures of another time and place, not somewhere in the same world as ours.